"Mining for BioBricks" software designs new devices depending on the user defined input and output parameters by searching all biobricks in iGEM 2011 distribution plates. After all possible devices and constructs are listed, a ranking is performed based on the scoring system we have developed in order to suggest the best possible biobrick combination for the job described by the user. The novel scoring system we have developed and implemented this year efficiently characterize and ranks biobricks distributed to the iGEM teams and any possible new devices that can be build from these parts in terms of status,results, quality, and rating. While M4B is an innovative approach to design synthetic devices from biobricks, it also stimulates the construction of innovative devices, as it reveals different biobrick combination to achieve same end function with the same starting stimuli. The print out function implemented in the software allows easy recording and sharing of the resulting biobrick constructs between researchers or teams. 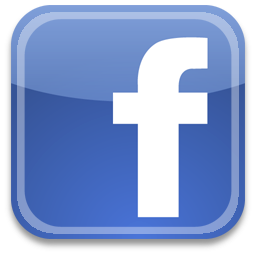 We are planning to integrate an option for sharing the favorite results image through a social network such as facebook or tweeter, which will also increase the awareness of public about our research and synthetic biology. In the results section of the M4B, the author information for each biobrick suggested to be included in a device is provided along with other features and informaiton. We specifically want to point out the avalibity of ownership information because citation of the work done previously was important for us to follow the scientific etiquette. While M4B is suggesting novel device combinations, the owners of the each biobrick within the new device is credited with this functionality. METU-BIN attended International Symposium on Health Informatics and Bioinformatics (HIBIT) 2011 and a roundtable was organized and moderated by our team. 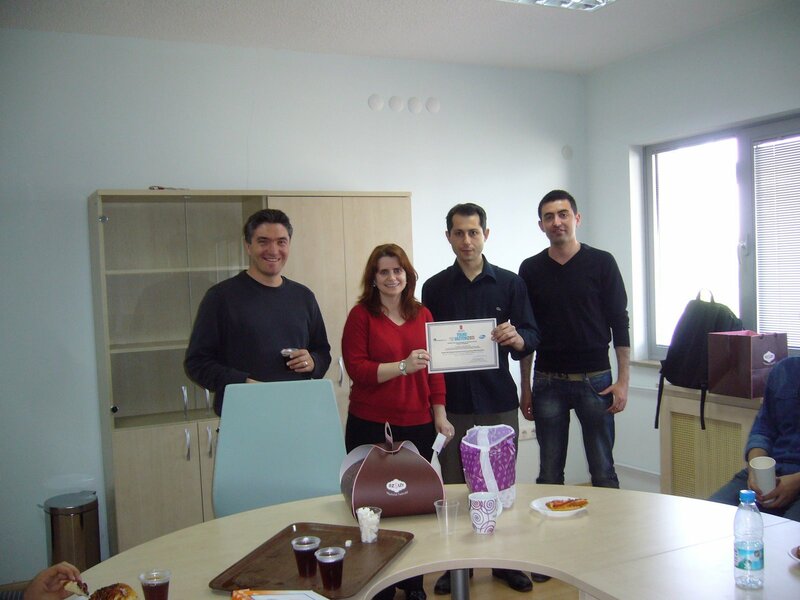 The HIBIT series has been initiated by the Informatics Institute at METU in 2005. HIBIT aims to bring together academicians, researchers and practitioners from the general area of health or medical informatics and bioinformatics or computational biology. Biomathematics, statistics and other related and supporting fields are also welcome and have contributed papers and posters in the past. Visit official website of HIBIT'11 for more information. Synthetic Biology is a discipline that embraces the emerging ability to design and synthesize novel DNA constructs, new genomes and biomimetic systems. Biomimetic systems are human-made processes, substances, devices, or systems that imitate nature. Therefore, we can define synthetic biology as an emerging field which aspire the usage of synthetic technology in order to create novel molecular machines for the good of human beings and bring insight to current biological questions by providing new approaches and methodologies. In addition, synthetic biology contributes to the accumulation of molecular data. Since 2004, Registry of Standard Biological Parts (a.k.a Parts Registry) is the only source for the standardized biobricks, which currently harbors 700 available and 2000 defined parts. Annual iGEM competitions continue to help for the accumulation of new biobricks each year. Due to the exponential growth observed in the number of biobricks, application of bioinformatics techniques is urgently needed for the organization, analysis and association of the data in the Registry of Standard Biological Parts and for the prediction of functional device candidates without using wet laboratory. In this roundtable a brief introduction to synthetic biology will be given and research areas where bioinformatics applications can be applied in synthetic biology will be presented. Following the introduction to the field, discussions on the current topics of synthetic biology research and how bioinformatics can be utilized to address these issues will be conducted. Major discussion topics will be on how bioinformatics can be utilized to aid in organization and presentation of the Registry of Standard Biological Parts, and solutions that can be offered regarding safety, ethics, and ownership in the emerging field of synthetic biology. Although, synthetic biology has scientific and industrial potential, it is hard to foresee and predict potential misuses and dangers. We will be also discussing potential threats of products and publication of these through web-based databases. Discussions will be organized in to two major topics. Firstly, current applications of bioinformatics in synthetic biology will be discussed. The major aim of the first session is to bring different disciplines together and create an interdisciplinary environment for information exchange and inspiration. Secondly, possible open questions and major discussion subtopics which regard safety and security, ownership and ethics will be included and potential solutions for major problems by using bioinformatics will be discussed as well. Introduction to the state of the art in Synthetic Biology and current issues of the field. What are the major literature resources for Synthetic Biology related research? 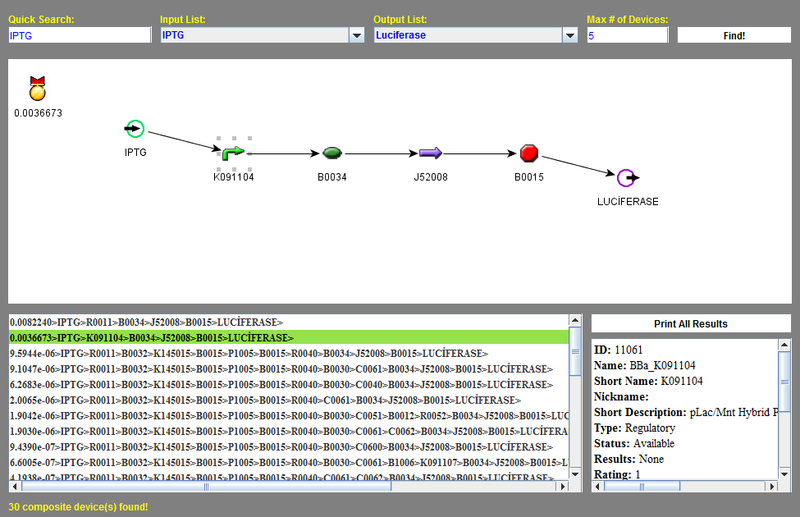 Existing Bioinformatics tools and techniques used in Synthetic Biology. Discussion Session "Applications of Bioinformatics for Synthetic Biology"
How would the application of Bioinformatics methods enhance Synthetic Biology in general ? Specific areas of synthetic biology new bioinformatics applications are needed to be developed? the sharing of BioBrick Parts or Devices as information via the internet. Language of choice for developing software geared for Synthetic Biology. SBML, SBOL and other choices. As bioinformaticians which other disciplines we need to collaborate while addressing issues for synthetic biology, such as Biological Sciences, Engineering, and Statistics. This round table will be presented and moderated by the METU-BIN Team, who will be representing METU at iGEM 2011 in Software Category on November 2011. Click on the image to view larger size. 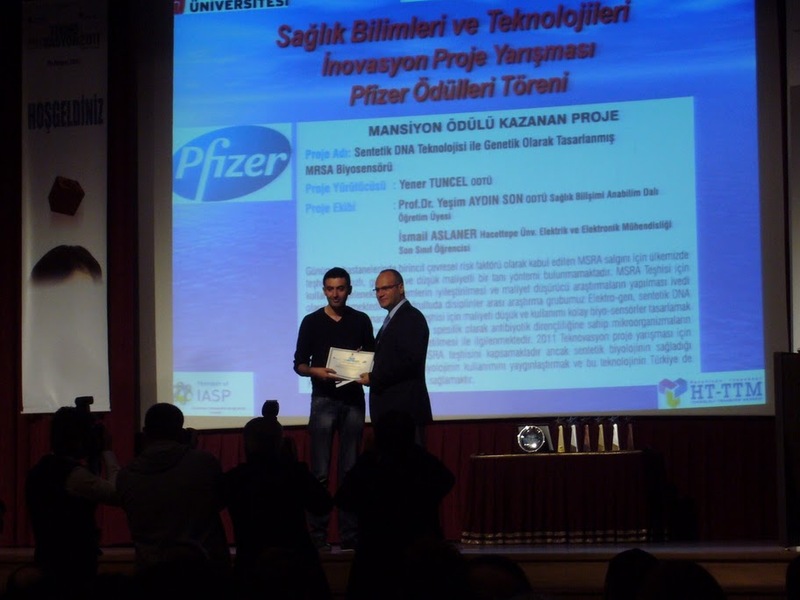 We have entered a nation-wide project competition organized by Hacettepe University with our project titled "Genetically Engineered MRSA Bıosensor based on Synthetic DNA Technology". 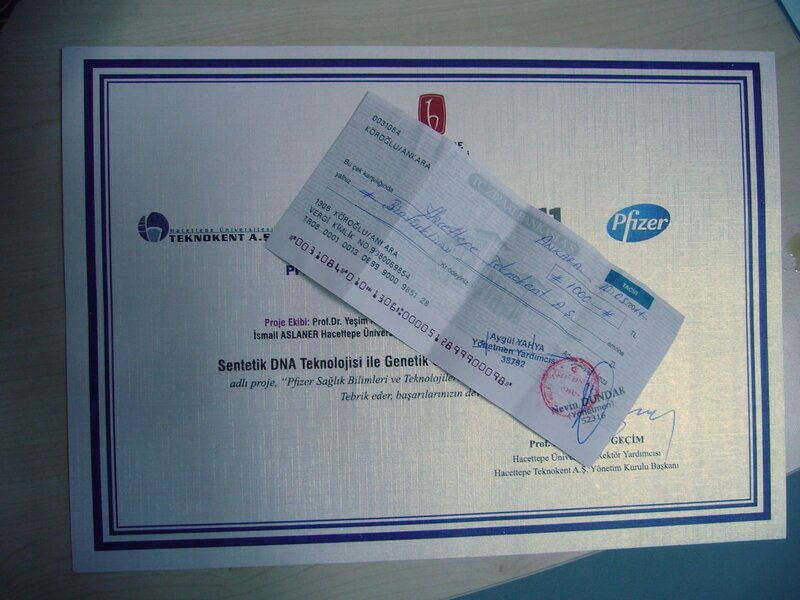 We have been placed 5th place and got our first financial support for 2011 iGEM competition. DNA School - 1: We have organized an introductory course for pre-school kids on fundamentals of molecular biology which is allowed us to spread seeds of synthetic biology into the young minds of kids continuing to METU College. DNA School - 2:The interest was high as our presentation got lots of follow up questions. DNA School - 3: After how DNA is build up was clear we have put to gather a model of DNA double helix as a whole class. Each kid selected a letter representing one nucleotide and colored it appropriately. DNA School - 4: Next was to finding the right spot for their nucleotide on the DNA code. DNA School - 5: After all nucleotide bonds were in place we have talked about the role of DNA in organisms and its applications based on DNA in our daily lifes. DNA School - 6: Close up of the DNA double helix model build in classroom Hz-A. We have leave these models as a thank you gift to the classes for their participation, which will continue to stimulate their curiosity about molecular genetics.